In the Holy Quran, Allah the Exalted, in various verses in the context of various topics has drawn the attention of His servants that He is Most Forgiving and Ever Merciful. These verses that I have recited, in the first of them, this same subject has been discussed. And in it there is a beautiful message for every such person who is fearful of the punishment of God for having committed sins and wishes to absorb the Mercy of Allah and benefit from His Mercy and Forgiveness. Allah, the Exalted, says, “O My servants despair not My mercy. I am the Master and possess the Power to forgive your sins and wrap you in the raiment of My Mercy.” What a beautiful message and how it lifts our hopes and does away with hopelessness. This is the very message which is saying to the people that hopelessness is a sin. This message takes us in the direction of saving us from weaknesses and keeping us away from the failures of life. This is so because it is hopelessness that often becomes the cause of weakness and lead one to failures. But hopelessness and failures cannot approach the one who comes under the Mercy of Allah, the Exalted. This is the message that shows us the ways by walking upon which we can fulfill the commands of God and achieve the love of God so that by acquiring His nearness we may be able to go on benefiting from His Mercies. So if you claim to have faith, always be hopeful of receiving the Mercy and Forgiveness of God. You have become involved in some bad deeds due to your human frailties but you are not of those who have become lost or gone astray because it is only those who have become lost who lose hope of God’s Mercy. These are the people who do not believe in God Almighty. They do not believe in His Graciousness. Hopelessness is a characteristic of those who have gone astray. So certainly for those who are agitated and restless because of their own state of being, there can be no more comforting and more sympathetic message than this. Here, the concept extends well beyond just applicability to those who believe. Here it is not just the believers who are being talked about. This Mercy reaches even those who do not believe. And for the believers it has been deemed obligatory. He can and does forgive all sins. This is what Allah, the Exalted, is saying. He is the Master. For Him to Forgive He is not constrained by anything. But does such a Loving and Merciful God’s Mercy and Love not require that we should increase our love for Him by obeying Him and acting upon His commandments and become closer to Him and try to the best of our abilities to get rid of our weaknesses and mend our sinful ways. All these things that I have stated based on the teachings contained in the Holy Quran and similarly the traditions or narrations of this type of the Holy Prophet (sa) that reach us – all of them tell us that no one, no person is beyond the pale of effecting a reformation. No matter how far gone the situation of a person may have deteriorated, reform is still possible. Everyone can be reformed. Everyone can gain benefit of the Mercy of God Almighty so long as he tries truly to purify his heart and actions. In the past few days a lady in Denmark wrote a piece in a religious newspaper and said about the Holy Quran that in it there is repeated mention of punishment and wrath of God and there is no mention of love except in one or two places. And that it can never be said truly at least – by Muslims – that a man believes in God voluntarily and freely and because of his love for God. Quoting some verses without understanding them or mentioning them out of context she has tried to put forth her inference that the God of Islam is quick in punishment and hard. The Jama’at of Denmark is writing a rebuttal of this article but I have presented these few references from the Holy Quran which, while they give a message of hope to the believers they also provide answers to these types of writers and enemies of Islam who ascribe falsehood to Islam and have malice in their hearts towards Islam and the Holy Quran. Allah, the Exalted, is the Master. He forgives. This attribute of His encompasses all His other attributes. He forgives and He shows Mercy. This is His Mercy that despite the innumerable excesses and wrongs committed by man He does not hurry to punish. But, yes, it is true that because of committing excesses beyond the limit and then being obstinate, Allah, the Exalted, says that you will receive punishment. If you continuously go on committing sins and excesses and do not stop, no matter what, you will become subject to punishment. This is the law of nature and in fact this is the law that is operative in the world also. But even then Allah, the Exalted, is so Gracious, that a time will come when Hell will become empty. This is how expansive and unlimited God’s Mercy is. In these verses, after mentioning His Mercy and Forgiveness, Allah, the Exalted, says that if you still do not take benefit of My Mercy and Forgiveness then there is, for you, also punishment for your sins and excesses. But nevertheless, it is my Mercy and Forgiveness that is drawing your attention again and again that you should safeguard yourselves before such a time that some punishment surrounds you. Do not commit excesses beyond all limits so that you become caught in My punishment. So try to save yourselves. So now, those who criticize even upon knowing all this what should one say except that that their thinking is blind and their hearts are filled with malice, antagonism and ill will. When they formulate the laws of their own countries they indeed want to punish for crimes but those who break the commandments of Allah, the Exalted, and who commit excesses and wrongs – about them they ask why does God Almighty say that I will punish such people. Hazrat Abu Saeed (ra) narrates that the Holy Prophet (sa) said that among the Children of Israel there was a person who had committed 99 murders. [These examples are being given so that we may be informed about the Mercy of God which has been in existence from the beginning and shall remain forever.] The Holy Prophet said that this man had committed 99 murders and then he started out to ask about repentance. He came upon a hermit, a monk and asked him whether he could now repent? This hermit said no, there is now no way to repentance. This man killed him also. He kept asking about this after that as to whether repentance can be achieved or not even after all these things and a man told him to go to a certain place. But as he was going there he died and before breathing his last, and as he fell, he turned his chest towards the direction of this place he was heading towards. The angels of mercy and the angels of punishment arrived and started to dispute about the fate of this man. Allah, the Exalted, ordered the place he was travelling towards to draw near to him and ordered the place from which he was travelling away to become distant from him and then ordered the angels to measure the distances to both these places from where the man had died. And it turned out that the man had died just a tiny distance closer to the place towards which he was travelling to achieve repentance than the place from which he was going away. So Allah, the Exalted, forgave him for this reason. So this is the God of Islam Who prefers forgiveness instead of punishment and Whose Mercy is the most expansive. Then there is another narration. Hazrat Abu Dharr (ra) narrates from the Holy Prophet (sa) that he said concerning His Lord, the Exalted, that He says: O son of Adam, you do not pray to me and yet entertain hope also. So I say, with the sole condition that you do not associate partners with me, I will forgive all other sins and shortcomings, even though your errors be the size of the entire earth. I will come and meet you with my forgiveness that is greater in expanse than the earth. And if you have committed errors so tall as to reach the heavens, and you ask for My forgiveness, I will even forgive you such large errors and will not care an iota’s worth. This is Allah, the Exalted, Who is the God presented by Islam, Who is the Most Forgiving. And we, the believers, how greatly beholden we are to Him for His enormous beneficence from among which one is that every year in the month of Ramadhan, the doors of His Forgiveness open even more widely. Nadhar bin Shaban says that I said to Abu Salma bin Abdur Rahman that tell me something that you had heard from your father that he heard from the Holy Prophet (sa) directly concerning the month of Ramadhan. He said, yes and narrated that the Holy Prophet said that Allah has made the keeping of the fasts in the month of Ramadhan obligatory upon you and I have initiated its establishment for you. So whosoever, keeps these fasts with the intention of winning reward from Allah and having full faith – such a one frees himself from sins to such an extent as to become as free of sins as the day his mother had given him birth. He becomes like a newborn child. So we are not concerned with how the ignorant see the God of Islam. We know for certain that our God is more loving and forgiving towards us even than our own parents. And our God is He Who comes running towards us so that He may forgive the sins of His servants. Then, with reference to the month of Ramadhan there is another narration in which the blessings of Ramadhan have been mentioned. Salman (ra) narrates that the Holy Prophet (sa) addressed us on the last day of the month of Shabaan and said: O people, a grand and blessed month is about to commence. In it is a night which is better than a thousand months. Allah has made the keeping of the fasts of this month obligatory upon you, and made its nights for offering the voluntary prayers. This is the months whose first ten days are mercy, its middle ten days are the cause of winning forgiveness and its last ten days are for obtaining safety from the fire of Hell. And anyone who feeds one who is fasting in this month shall be given such a drink from my reservoir that he will never experience thirst till the day he enters Paradise. In other words the forgiveness is of a type that causes previous sins to be washed away and also grants strength to resist the temptation to commit sins moving forward if the fasts are kept as required by the month of Ramadhan and voluntary prayers are offered and Allah, the Exalted, is worshipped. So it is clear that Allah, the Exalted, is making arrangements for us at every step that take us to Paradise. We are passing through the month of Ramadhan these days and the second ten days of Ramadhan is coming to an end and the third period of ten days is about to commence tomorrow or the day after. And this period is full of blessings from this point of view also that, as stated in the hadith, there is a night in this period that is the Night of Destiny, the lailatul qadar. This night is a great means for seeing the signs of the acceptance of prayer, and drawing a servant of God as close as possible to God. So let us take particular care to perfect our prayers and worship in this last ten day period of Ramadhan. There is need also to make whatever we gain in this month to make it a part of our daily lives. To continue to benefit from the Mercy and Forgiveness of Allah, the Exalted, we need to especially keep an eye on our own condition in these days and try to discharge the dues of Ramadhan and in particular of these last ten days of Ramadhan. To try to remove one’s own bad habits, to safeguard oneself from committing sins in the future, to achieve permanent salvation from the fire of Hell, an effort is needed. For every thing an effort has to be made. It cannot be that we achieve something without any effort. This is a general rule. And it is expected from a true believer that he should not look casually at the messages from God and from the Prophet of God. Rather, when they hear, there should develop in their hearts an urge to make these messages a part of their lives. And this desire and urge will become beneficial only when practical steps will be taken to achieve these things. And the practical steps that can yield results and take one towards success are only those that are in accord with those rules and means which have been set in place to achieve these things. So, without a doubt, the Mercy of Allah is indeed All-Encompassing. And yes without a doubt there is a greater multiple of reward bestowed for good deeds during Ramadhan. And yes, without a doubt the month of Ramadhan is a means for the acquisition of Mercy and Forgiveness and for distancing oneself from the Fire of Hell. But ongoing and permanent benefit from these things can only be gotten by those who continue to try and gain these benefits with a dedicated and ongoing continuous effort. So most fortunate, from among us, are those people, or shall be, most fortunate, those people, who shall make this Ramadhan the means of achieving God’s Mercy and Forgiveness and secure for themselves safety from the fire of Hell. They shall thus secure release from their weaknesses and safeguard themselves permanently from committing sins. May this Ramadhan become a milestone for us forever keeping us away from evil and forever become the means to take us towards every good and righteous deed. Such hate may grow in our hearts for evil that we may never again even think of approaching these evil deeds. May our attention become diverted towards true repentance, such repentance that will forever continue to become a means of drawing us nearer and nearer to God Almighty. If we are to acquire high morals and excellent conduct and draw near to God Almighty then it is repentance alone which comes in handy for the purpose. It is with repentance that one advances and makes progress. This is the thing that assists in the task. “And it makes a man perfect. In other words, the person who wants to bring about a change and acquire the correct morals, it is incumbent upon him to repent with a true heart and sincere motivation. It should be borne in mind that there are three conditions for repentance, without fulfillment of which true repentance is not achieved. The first condition is to get rid of wicked fancies which arouse evil propensities. Fancies have great influence. Every action is preceded by a fancy. Thus the first condition for repentance is that evil thoughts and fancies should be discarded. For instance, if a person has an illicit relationship with a woman and desires to repent, it is necessary that he should conceive of her as ugly and should call to mind all her low qualities. As I have just said fancies exercise a powerful influence. I have read that some Sufis carried their fancies to such a length that they saw a person in the form of an ape or pig. Thus the first condition of repentance is that all thoughts which give rise to evil pleasures should be discarded altogether. The second condition is remorse. Everyone’s conscience admonishes him over every evil, but an unfortunate person leaves his conscience suspended. So a sinner should express remorse over his sin and evil action and should reflect that the pleasure to be derived from them is temporary. He should also consider that every time there is a decline in that pleasure and that in the end, in old age when his faculties are weakened, he will perforce have to give up all these pleasures. Then why indulge in that which in the end has to be given up anyhow? Most fortunate is the person who turns to repentance and becomes determined to discard all corrupt thoughts and vile fancies. When he gets rid of this impurity, he should be remorseful. All power belongs to Allah (2:166). This is his reality. So to acquire strength from Allah, the Exalted, one must make perfect the above mentioned three things and leave off laziness and indolence and becoming totally engaged, pray to Allah, the Exalted. Allah, the Exalted, would then bring about a change. This is the statement of the Promised Messiah (as). Those people should always remember this who say that we prayed to be safeguarded against this or that evil but this bad habit has not gone away. Allah, the Exalted, has not heard our prayers. Some parents become concerned when the children or young men develop bad habits. They say we have tried and prayed also but our prayers have not been heard. So it should be known that this is wrong. For the acceptance of prayer also there are some requirements. They need to be met. Praying for four days and then saying that Allah, the Exalted, has not heard our prayers is transferring one’s own failure on to the shoulders of God. Nevertheless, I have just read the quote from the Promised Messiah (as) on how one can save oneself from evil. To repent and to save oneself from evil there are some necessary things that have to be done. There are some deeds and some efforts that are needed and there are some ways that need to be practiced or carried out. When you will carry those out then the results will manifest themselves. And the prayers to be saved from evil will only be accepted when some practical steps will be undertaken. Not taking any practical measures and just praying and even that in a casual manner and then saying that the prayers have not been accepted and perhaps it is the intent of Allah that one should remain a sinner, is wrong. If it is desired that an improvement happens and one leaves bad morals and deeds then the Promised Messiah (as) has said there are three things that a person himself needs to do. Then he should pray and such prayer will be a source of help and the evil drops off. And to effect a true repentance first cleanse your mind of the bad thoughts. First there develops a taste for the evil in one’s mind, then a person goes and commits that evil deed. If such thought does not take birth in the mind and if instead a hate develops against that foul deed then the person never moves to carry out the evil deed. It is only when there grows in the mind a pleasure and taste for that deed that one moves on to carrying it out. So the very first practical step that one has to take in order to save oneself from an evil deed is to purify your mind of these evil thoughts and temporary pleasures. The example that the Promised Messiah (as) gave is that of an illicit relationship with a woman, and friendships are established. So instead of having a good impression of such a woman in one’s mind, replace it with a bad impression. Instead of looking for her beauties, establish in your mind as bad a picture of hers as possible. Bring to the fore her bad characteristics and establish such an image of her face in your mind that should be extremely ugly and hateful. Only in this way would you be able to distance yourself from this evil. Then the second condition the Promised Messiah (as) informed us of is that you should awaken your good and righteous conscience and think what evils you are getting involved with. Develop in your hearts a sense of remorse. Only then will you be able to avoid this evil. Then the Promised Messiah (as) said the third condition is that you should have a strong and firm resolve that I am not going to even go near this evil. And when you will be making an attempt to save yourself from this evil constantly, then God Almighty bestows the favor of true repentance to be granted and He listen to the prayers done to be saved from evil deeds and bad habits. These are all the things that need to be done before praying. It should not be that one is involved day and night in evil and once or twice a prayer is uttered asking that one be saved from this evil. These actions are clearly demonstrating that the prayer has not been uttered in all sincerity. The righteous spirit, one’s conscience that is hidden inside, showing up at some one time and reminding that what a state you are in and committing these evil deeds, and as a result temporarily uttering a prayer but becoming subdued upon the desire for evil coming to the fore and the feelings of remorse caving in ..such prayers cannot save one permanently from evil nor make one capable of discharging the dues of a true prayer. In fact this is tantamount to making fun of the concept of prayer altogether and trying to put God under an obligation. God Almighty is under no obligation to anyone. Such people need to remember that if you want to take real benefit from God’s Forgiveness and inherit His Favors and see your prayers being accepted, then you need to turn your attention to your own state of being. As I said, Allah, the Exalted, is so gracious upon His servants that He is always ready to envelop His servants in His mantle of Mercy. Does this not demand from us that we should be ready to walk upon the paths He has laid out for us and thus benefit from His Mercy. We should acquire that Mercy that is attained by true believers and by those who love Him truly. Try to save ourselves from those things that despite His all encompassing Mercy make one deserving of His wrath and punishment. May our repentance be true repentance and we remain ever in prostration in front of Him. The Promised Messiah (as) says: Cleanse your actions and be ever involved in the remembrance of Allah and do not become heedless. Just as wild animals who run to save themselves when they become even a little bit lazy get trapped by the hunter similarly one who becomes forgetful of the remembrance of Allah, he becomes prey to Satan. Forever keep repentance alive and never let it die because that part of the body that is used constantly is the one that is always of use and the one that is left unexercised is the one that becomes useless forever. So keep repentance active always so that it should not become useless. If you do not turn to true repentance then its case will be like that of the seed that is planted on a rock but if you employ true repentance then its case is like that of the seed that is planted on the best soil and yields fruit at its appointed time. These days anyone trying to achieving true repentance faces a lot of difficulties. The attractions of the world and its temptations hinder us. May Allah make us among those who offer true repentance and may we forever continue to inherit the favors and grace of Allah. And may He make us beneficiaries of all the blessings associated with this blessed month of Ramadhan. Aameen. Now after the Jumu’ah prayers I will lead three funeral in absentia prayers. The first funeral in absentia prayer is for Mukarram (Respected) Muhammad Imtiaz Ahmad Sahib son of Mushtaq Ahmad Tahir Sahib of Nawabshah. He was martyred on July 14, 2014. Inna lil-lahay wa inna elaihay rajayoon. He was 39 years old. It is said that some unidentified motorcyclists arrived at their store in the evening at around 4:30 pm and they shot him to death. Inna lil-lahay wa inna elaihay rajayoon. According to the details received Muhammad Imtiaz Ahmad Sahib was standing outside his store in Nawabshah City’s Trunk Bazar when two unknown motorcycle riders approached and fired their weapons on him and took off. As a result of the firing three bullets struck him two in the head on the right and went through his head leaving from behind his left ear. The third struck his hand. In any case he was martyred there and then. Inna lil-lahay wa inna elaihay rajayoon. In Nawabshah, up till now, and as a consequence of religious bigotry and hatred, this is the ninth martyrdom to take place and in the last few years most martyrdoms have taken place here. Two or three days before the occurrence of this incident the deceased was informed by a nearby shopkeeper that some opponents are conspiring against you and that you should stay alert. In any case, no matter how much care one takes one has to leave home and go outside and the enemies find an opportunity. The family of this martyr was introduced to Ahmadiyyat in 1935 through his grandfather Seth Muhammad Din Sahib of Amritsar who had done the Bai’at through Naimatullah Khan Sahib of Wazirabad. In 1947 they shifted from Amritsar, India to Nawabshah, Pakistan. He was born in 1975 and after obtaining his F.Sc started work with his father. He was very involved in serving the Jama’at. At the time of his martyrdom he was serving as President of his Halqa [local area]. Secretary Tehrik-e-Jadid. Secretary Islah o Irshad of the city. Qaid Khuddamul Ahmadiyya…He was always ready to do whatever work was given to him to do for the Jama’at. He would carry out all such duties with great care and diligence. He never refused. He was a great host and would take great care of the guests from the Center and possessed a very strong love for Khilafat. He possessed an extraordinary passion for obedience. He offered all his five daily prayers and tahajjud prayers. He spoke softly and possessed a simple, cool temperament and he was ever ready to forgive. Last year he had joined in the Jalsa Salana in Qadian, India also. On the day of his martyrdom, in connection with the blessed month of Ramadhan, he had prepared packages of rations for the needy by mid-day and had delivered them to seven houses. When he reached back after having done this these unknown unfortunates ones attacked him and caused his martyrdom. He was a moosi by the Grace of Allah, the Exalted. He was the son of a brother of Seth Muhammad Yusuf Sahib, Former Ameer of the Nawabshah District who himself was also martyred. His father Mushtaq Ahmad Sahib is alive. He leaves behind his wife Jamila Imtiaz Sahiba and three sons: Jazib age ten years, Abdul Kauser age nine years and Muhammad Abdullah Umar, seven months.. The second funeral in absentia is that of Mukarram Naseer Ahmad Anjum Sahib who was a lifelong devotee and was a teacher at Jamia Ahmadiyya in Rabwah. He had passed his metric exams in 1981 and then he dedicated his life and arrived at Jamia for studies. He completed his BA in the Jamia and then upon completing his Jamia studies he did an MA in Arabic studies. He had also done a course in Russian. In 1988 after getting his Shahid degree he entered the field of actions. He stayed in different Jama’ats. In 1990 he was appointed to teach Comparative Religious Studies in Rabwah and he kept serving in this capacity till the end of his life. He served for almost 26 years after leaving Jamia. Despite his young age he was considered an authority in the field of Comparative Religious Studies by the Grace of Allah, the Exalted. He possessed deep knowledge. Apart from teaching at the Jamia he was blessed to serve in many other offices. He was one of those in Qaza whom Hazrat Khalifatul Masih IV had appointed and remained in that post till his last breath. In Khuddamul Ahmadiyya he served on several different positions. One beauty of his character told to us by his family was that he could not tolerate hearing anything against the System of the Jama’at. If any of his children would say anything against any officeholder of the Jama’at he would try to make him understand and if anyone would try and say something against some officeholder or against some decision he would try to explain and make the person understand. 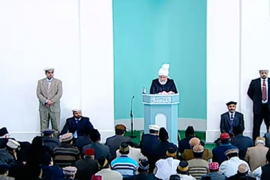 He was blessed to join the Jalsa Salana UK and he addressed the Jalsa in 2010 also. He had written to me this time also that I have applied for a visa which was rejected but he applied again. He had an extraordinary love and connection with Khilafat and he was among the true sultanan naseera – the mighty helpers.He possessed a great zeal for preaching wherever he would go and he had a great mastery over this field and he could make even very great people accept his argument based on his proofs etc. His daughter Khadija Maham has written he possessed ardent love for the Promised Messiah (as) and stressed intensely the need for reading of the books of the Promised Messiah (as). He was compiling a dictionary of the books of the Promised Messiah (as) and was always desirous that this valuable treasure should reach to the people. He was writing a dictionary of the difficult words so that the people could take benefit of the books of the Promised Messiah (as). He had just started this work. Mubashar Ayaz Sahib has written that he was a good speaker. He participated in the Rah-e-Huda and many other MTA programs and would always give very solid and well founded replies. May Allah have mercy on him and elevate his station in Paradise and may He bestow upon the Jama’at many more such learned and practicing devotees. Aameen. The third funeral in absentia is that of Mukarram Sahibzada Mirza Anwar Ahmad Sahib who was the son of Hazrat Musleh Maood (ra) and that of Hazrat Umm-e-Nasir. He passed away last Monday. Inna lil-lahay wa in-na elaihay rajayoon. He passed his metric exams in 1944 and upon the wish of Hazrat Khalifatul Masih II entered the Agricultural College and then the arrangements for the rudimentary building of Daruz Ziafat which was in front of Masjid Mubarak was given to him by Hazrat Musleh Maood (ra). The beginning work of the current Daruz Ziafat also were carried out during his charge. He served as Afsar Langar Khana till 1982/83. Then he served as Naib Nazir Umoor-e-Aama. He was married to Sahibzadi Sabeeha Begum Sahiba. He has three daughters and one son. From among the marriages of her grandsons that Hazrat Ammajaan participated in, his wedding was the last in which she had participated. Dr. Noori writes that he would frequent Tahir Heart Institute to assist the poor and he would leave monies for the purpose with me. He was the brother of our mother and had a close relationship on that account and so frequented our house very often. He maintained this relationship and then after Khilafat he kept up a very strong relationship with me also. He would call many times here to express this connection and relationship. May Allah also have mercy on him and forgive him and elevate his station in Paradise and bestow upon his progeny also a strong connection of loyalty with Khilafat-e-Ahmadiyya. Aameen. His wife is also quite ill. May Allah have mercy upon her and bestow His Grace upon her. As I said, after the Jumu’ah prayers, these funeral in absentia prayers will be offered.